Painted on location with special permission, commissioned in aid of HMS Victory’s renovation to her 1805 condition. This marine painting measures 50 x 76 cm (20″ x 30″), the picture is now part of the Victory 2005 Ltd Trafalgar Collection and available, price on request. 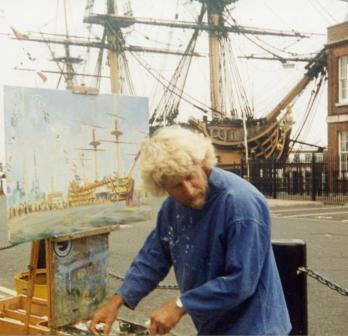 Marine art in action, painted on location, HMS Victory during the 400th Anniversary of Portsmouth Dockyard. One of a series of HMS Victory. It is very “rare” to see contemporary paintings of the ship as she was towards the close of the 20th century. 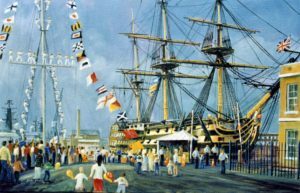 I needed a permit, a special permission to create this painting inside Portsmouth Dockyard. Producing this painting also gave me a further opportunity to really ‘look’ at Victory and as we know, looking is the key to all good painting.